Xylene’s major safety hazard is its flammability. As a result, it is important to use appropriate precautions when handling this chemical in the workplace. In case of contact with the skin or eyes, xylene can lead to redness and irritation. If ingested, this chemical may cause moderate gastrointestinal upset, including abdominal pain, nausea, and vomiting. Acute inhalation of the vapors can affect the central nervous system, causing headache, weakness, dizziness, loss of coordination, and difficulty breathing. In the event of a spill, use self-contained breathing equipment to avoid inhaling xylene vapors. Always wash your hands thoroughly after handling xylene or any hazardous chemical, and ensure quick access to eyewash stations in the workplace. Eye Contact: Remove contact lenses, if present. Flush eyes with plenty of water for 15 minutes or more. Skin Contact: Flush skin with water. Use an emollient on any irritated skin and wash contaminated clothing before reuse. Inhalation: Loosen tight clothing and seek fresh air immediately. If breathing is difficult, administer oxygen. If breathing is absent, perform mouth-to-mouth resuscitation and get medical aid. Because xylene is extremely flammable, keep it stored in a segregated, approved area away from heat, spark, and sources of ignition. Keep away from incompatible materials, including oxidizing agents and acids. Ensure that the container is kept tightly closed and sealed until ready for use. 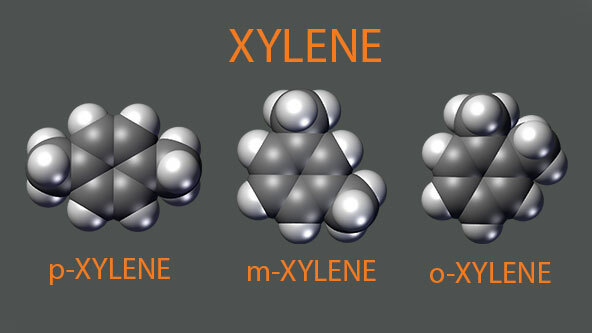 Xylene, like any chemical, must be disposed of in accordance with local, state, and federal environmental regulations. Need more safety information about Xylene or additional chemicals in your workplace? Check out our extensive MSDS database to learn more.